When temperatures drop, people start to head indoors to keep warm. But with close quarters comes a dramatic uptick in communicable disease, including norovirus. While often mistakenly referred to as the “stomach flu,” it is a completely different virus. 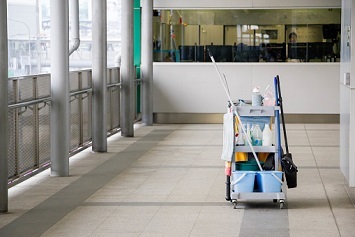 It is the leading cause of gastroenteritis, and with its rapid onset, norovirus can quickly overwhelm your workers if it’s not properly cleaned up. Norovirus presents with easily noticeable symptoms: diarrhea, stomach pain, and vomiting. This last symptom is particularly problematic, as one vomiting incident can be enough to spread the virus throughout the building. To make matters worse, norovirus can live on surfaces for up to two weeks, so quick and thorough remediation is essential. Put on rubber or disposable gloves and then wipe the area with paper towels. Disinfect the area using a bleach-based cleaner. Make sure the entire affected area is treated. Let the bleach-based disinfectant stand for at least 5 minutes. Then, clean the entire area again with hot, soapy water. Finish cleaning by cleaning soiled laundry, taking out the trash, and then washing your hands. You may also want to disinfect any nearby surfaces, such as countertops, utensils, or equipment, as norovirus can potentially spread through the air. If you don’t have an appropriate cleaner on hand, you could always make one, using bleach and water. The EPA recommends a solution with a concentration of 1,000 to 5,000 parts per million, or 5 to 25 tablespoons of bleach per gallon of water. There are also commercially available bodily fluid cleaning kits available, should you want to have specialized equipment on hand.